Horsetail Fall is seasonal waterfall that flows in winter and early spring. The fall comes off the El Capitan mountain in two distinct streams and drops some 1,570 feet onto steep slabs, spraying up in a mist before continuing down another 500 feet to the bottom of the mountain. 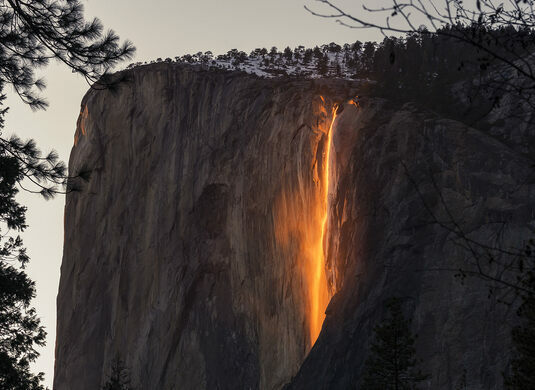 But as beautiful as the fall is by itself, it is the few days every year during the last two weeks of February when it becomes the “firefall” that people wait for. As the sun sets, and dips behind the horizon line, everything will begin to go dark and it will seem, for a moment, as if the firefall has failed to ignite. But as the last of the sunlight disappears it will hit and reflect off the falls at the exact right angle creating a spectacular, if short-lived, effect that looks like a beautiful flowing cascade of fluid fire. 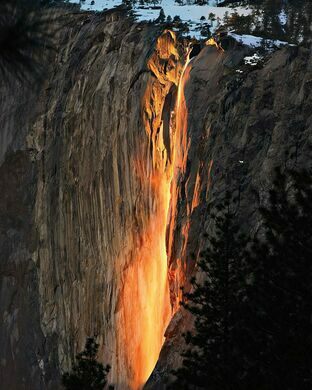 Bizarrely, Yosemite Park used to actually create “firefalls” by pushing huge piles of coals off the edge of a cliff. These were an incredibly popular tourist sight from the 1880s all the way through the 1960s, when the park realized this was a fire hazard (which seems kind of obvious) and stopped. 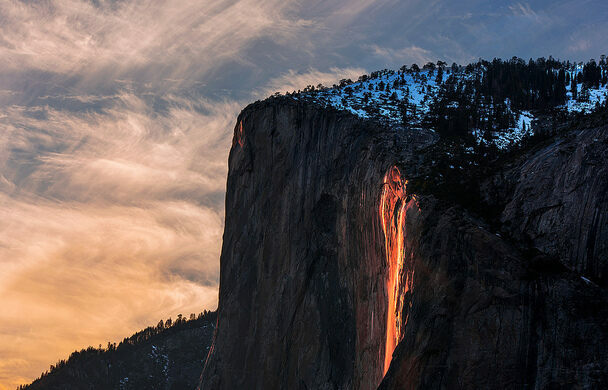 Luckily this natural phenomenon was able to pick up where the park rangers left off, after famed climber/photographer Galen Rowell noticed it and took a picture of the firefall effect on Horsetail Falls in 1973. 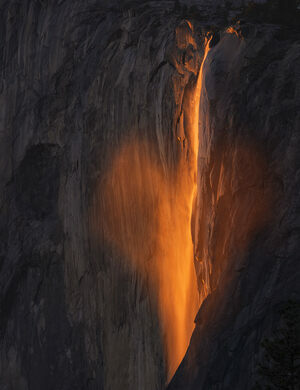 Firefall aside, Horsetail Fall is the second highest free-falling waterfall in Yosemite Valley. 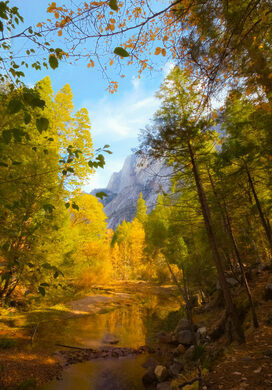 The highest is on the other side of El Capitan and is also seasonal. It’s called Ribbon Falls, but it doesn’t stand out from the flat wall where it free falls down to the valley floor as well as Horsetail Falls, which has an edge allowing people to view it from the side. 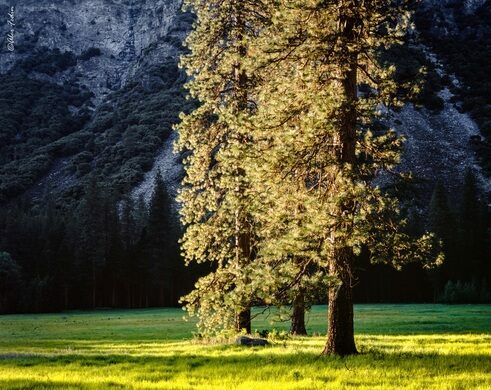 The most convenient, and frequently shot view of Horsetail Fall is at the El Capitan picnic area, approximately 1.7 miles past Yosemite Lodge at the Falls on Northside Drive. In late February, you’ll often see rows of photographers of all levels there catching the last rays of light in the evening. Of course, the most unique images often come from photographers willing to explore for different angles and locations that also capture the light of the Fall. According to local professional photographer, Nancy Robbins, there are many places that work. 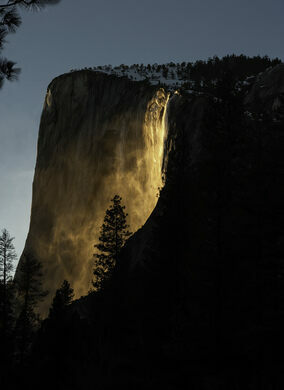 Just look for places where the falls will be backlit by the setting sun, such as along the river, or along the rim. Witnessing the might of this dessert-colored desert waterfall is a rare, powerful treat.